EHRKE TECHNOLOGY GROUP is a regional water treatment service and supply company, specializing in servicing HVAC systems and manufacturing process water. We service such marketplaces as commercial buildings, hospitals and healthcare facilities, colleges and universities, small to medium size manufacturing plants, school districts, government facilities, and mechanical contractors. We service and supply water treatment products and water treatment control and delivery equipment for cooling tower water, closed chill and hot water loops, steam boiler systems, potable water systems, and waste water applications. Gehrke Technology Group has been in business for nearly 20 years. Our mission is to provide the best water treatment service and products to our customers at a reasonable price. We have been able to accomplish this goal through securing and training great people who are able to consult, service, troubleshoot, educate, train, and work with our ever-expanding customer base. Our people perform wet chemistry tests on site, provide instant feedback and corrections, and use state-of-the-art communication in conjunction with laboratory backup service and advanced technology tools, securing optimal results for our customers. Gehrke Technology Group has invested in a fleet of trucks that have liftgate capabilities and material handling equipment for specialized deliveries. We staff our rolex replica trucks with delivery specialists who support our "HANDS-FREE" delivery system. This unique service is designed to free our customers from the liability and exposure of both the transportation and delivery of water treatment chemicals. In essence, we provide a truly drumless delivery system. We research and design advanced chemistry products for all the water systems that we treat, creating customized programs designed to insure superior results. Our goal is to provide our customers with the right products at the right place to do the right job for the right application. At Gehrke Technology Group, we recognize that one shoe does not fit all; our customers require customized solutions, and we provide them. Gehrke Technology Group supports and uses all manufacturers of water treatment controllers, chemical metering pumps, and accessories. For example, we support Aquatrac modem-based controllers, LMI metering pumps, Pulsafeeder equipment, Neptune feed systems, and Lakewood controllers. We are capable of handling on-time, real-time, Internet-based control to simple, standalone, and reliable feed systems. Alternatively, our staff of experts can design and engineer such systems as well. We value every piece of business, large or small. 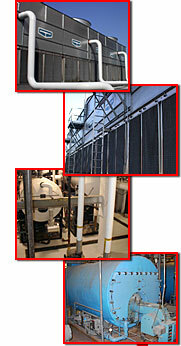 Regardless of your system size, we know that your water system is critical to your operation, and we treat it as such. Gehrke Technology Group provides traditional water treatment with superior results by using advanced technology products and practices. If you have water treatment needs, or if you are responsible for a water system, we would be delighted to hear from you. Feel free to contact us with your large or small challenges, and we will discuss your specific needs.